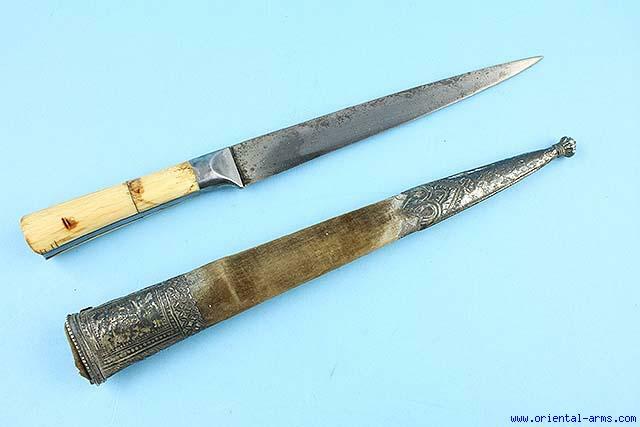 This Kard knife is Indian, North India, mid 19C. or earlier. Very good solid blade forged from Wootz (Damascus, watered) steel of good high contrast pattern, 8 1/2 inches long. Four sectors ivory grips with steel bolsters and steel grip strap. Velvet covered scabbard with chased silver mounts. All originals. Total length16 inches. Very good condition. light pitting spots on one side of the blade.